Fyt, Jan (1611 Antwerp 1661). 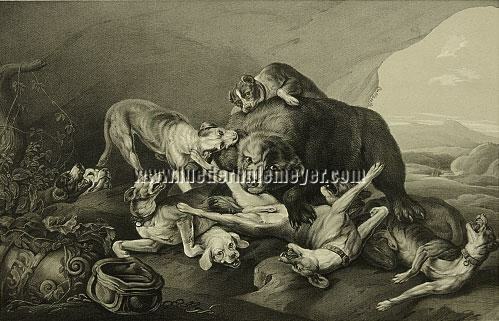 (The Bear-Baiting.) The bear by the opening of a den hard-pressed by many hounds, but still with good chance to survive if no hunters will come along. On the right prospects over a wide river valley. Chalk lithograph by Johann Woelfle (Endersbach, Wurttemberg, 1807 – Faurndau/Göppingen 1893) for Piloty & Loehle in Munich printed with beige tone plate. (1837/51.) 10¼ × 13⅛ in (26 × 33.2 cm). lithographic masterpiece reflecting the brilliance of the original .